Our world is a wondrous place full of natural plants, oils, and foods that shower us with beneficial uses. Every single day or week (at least) we hear of a new plant or seed that can aid in making our hair, bodies, and minds better, and often it is something that has been used for centuries. With modern innovation we are always looking to the stars for the newest and greatest invention to enhance our lives, but sometimes we need to just step back and see what’s already here. Nothing against man-made but nature is a beast at giving us all we need to make our lives and bodies better, and although the latest and the greatest may be exciting, going back to nature is always a much sweeter reward. Mafura oil or natal mahogany oil is from the mafura tree, which is also called Trichilia Emetica and cape mahogany. It’s found in Mozambique and other countries in Southern Africa. As a butter at room temperature and an oil at 65 degrees or higher, this wonder is high in essential fatty acids like palmitic, stearic, and linoleic. The oil is highly moisturizing and is extracted from the bright red fleshy seeds. One single tree yields around 20 liters of oil, and this amazing oil has antimicrobial and anti-inflammatory properties because of the presence of limonoids like trichilin. 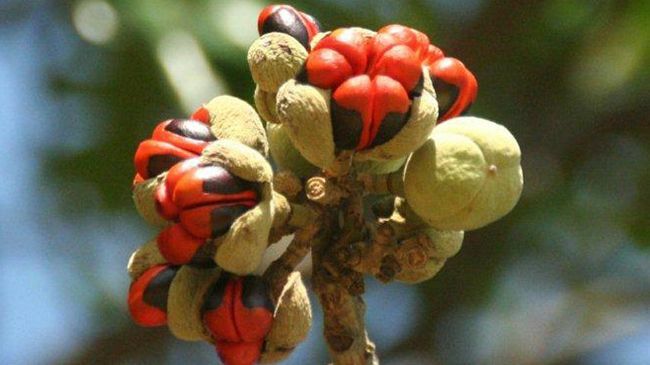 It is widely used in Mozambique and Zimbabwe as a skin moisturizer and hair conditioner. It is also known to treating rheumatism and heal wounds. It’s a non-drying oil that will quickly absorb in the skin while softening and improving the elasticity of the skin. According to Phyto Africa, it is excellent as a hair conditioner, moisturizer, or treatment to alleviate dry and itchy scalps. Ouidad Curl Recovery Defining Styling Soufflé also has mafura butter along with Kalahari melon seed oil that will envelop the hair shaft with protective barrier of concentrated fatty acids so vital to rebuilding and nourishing our strands. Ouidad Melt Down Extreme Repair Mask is also formulated with the butter and you can even find raw, unrefined mafura butter at Amazon.com. I think we are going to see many more product lines jumping on the bandwagon at adding this incredible oil and butter to their products. Move over shea butter, you may have a rival. Have you tried or even heard of mafura oil or butter?